A collective gasp came from the sea if elves gathered for Santa’s nightly pep talk. Only one silly sprite had ever been fired from his duty as a Mischief Maker. Poor Snowflake had emptied an entire bottle of Sudsy Bubble Bath in a tub, planning to float on a toy tube until morning. While waiting for the water to fill, he flitted to the kitchen to eat some of the red and green sprinkles someone had left on the counter. They were so good, he ended up eating the whole bottle. Even a whole bottle of sprinkles was too much for one elf. He whizzed around the living room, hyped up on sugar, and then passed out in a sugar coma on the floor. The bath water continued to run until the morning. The water overflowed and there were suds everywhere. It was an awful mess. Parents complained enough that poor Snowflake was fired. Since then, he’s been cleaning reindeer droppings in the barn. “Mischief can be made without a mess,” Santa finished. Nim and Lil flew back to the Durbin’s in silence. Both were worried about all of the chaos they had caused over the past few days. Some were worse than others, but still. Lil agreed and they landed on the kitchen table with a quiet flop, knocking over a toy T-Rex. Nim’s hat came off as he rolled across the table, and Lil crashed into the salt and pepper. “Oof,” cried Lil as the T-Rex knocked over the other dinos. The elves looked at the toys, the salt, the pepper and the glass of water someone had left on the table. In their clumsiness, they had already managed to knock over everything and make a huge mess. “Oh no,” Lil moaned, tears springing to her eyes. A slow smile spread on Nim’s face. He knew exactly what they would do tonight…and it wouldn’t make a mess at all. Nim smiled proudly as he strapped himself on to the top of the safari truck. A T-Rex was pulling the safari truck, Nim’s hat in his mouth. 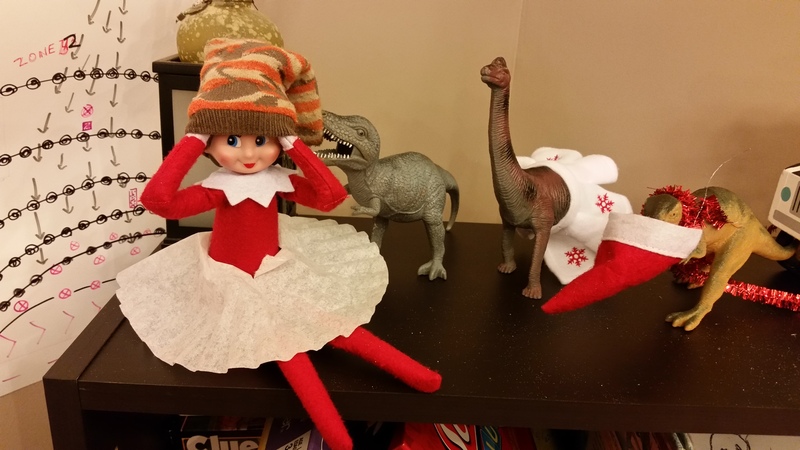 A long neck had Lil’s skirt on, while she was wearing a coffee filter and protecting her hat with a sock. “So, we were minding our own business when four hungry dinosaurs attacked,” began Nim. “We tried to stuff them in the safari truck but they were too sneaky for us,” continued Lil. And then they laughed and giggled and watched for the kids.